So my paper minis project is nearly ready for sale; I just have to acquire a decent x-acto knife and a cutting board to trim them better for some promo pics. This close to the finish line however I couldn't resist doing my best with scissors to see them standing after getting them printed yesterday, so here's a quick snap; these are all either M3, Freak 3 or Genesis. 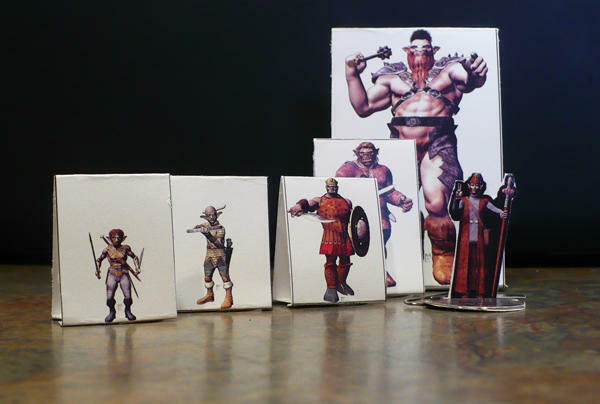 There's a fairly new product from Paizo (Link when I track it down) that consists of plastic bases and cardstock pictures of monsters. You could get blank cardstock and print the characters on label paper and it would look pretty cool. I really don't understand what you're trying to say here.. 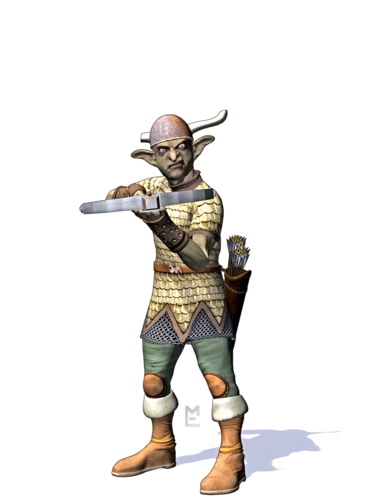 I'm designing the official Palladium Fantasy RPG® Paper Miniatures that will be sold on DrivethruRPG.com.. 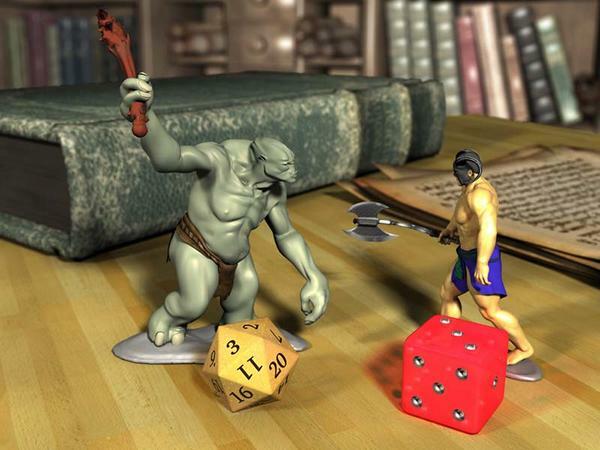 In order to finish the project, I need to assemble some of the minis and take promotional images of them to add to the final product, a .pdf document. As I live from check to check, I had to wait to get some money in order to get them printed. When I got them printed, I needed to wait to get a good cutting board and x-acto knife in order to cut them out right. My birthday is today, but since my work hours conflict with everyone else's, everyone gave me presents on Sunday, which included the knife and board. I just haven't had the time between the two jobs to cut them out yet. Friday I don't have to work my second job so I expect to spend the day before going to work at 3 cutting and assembling minis and hopefully taking some pictures to get finished. These look pretty cool and I was offering an idea of another way to use them. If you want to buy them and use them that way you certainly can; looking at the paizo product, I see how they might be similar. These however are for a specific game setting (though certainly useable in any RPG), and will be an official product of Palladium Books®. I've been working on this project for two years now, and it will be my first official product for an RPG company in 18 years. I've done over 100 unique characters for it (some of which have appeared in my other art projects). It's a labor of love and one that I'm excited to see people use and enjoy. I think that in the paper miniature market, they will go over well, considering the competition. Time has not been on my side; It will probably be Saturday before I can redress my minis to do a final photo. 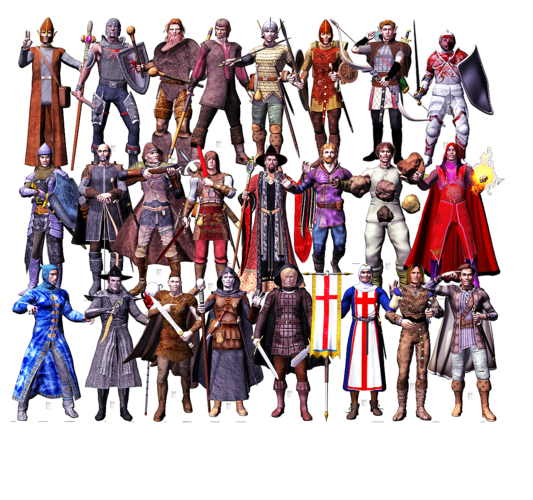 In the mean time, I have a new game starting soon and have done a group shot of the player characters. 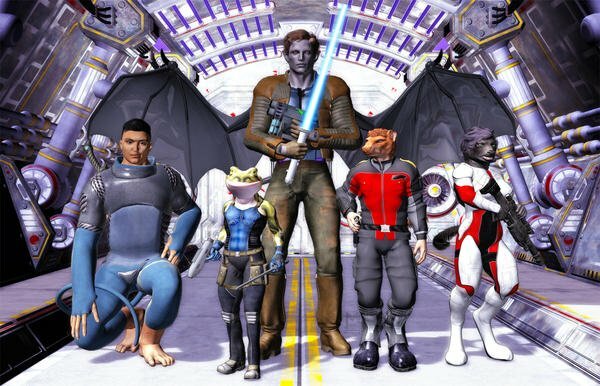 From left to right: Fealix the Fearnian Professional Combat Athlete; Tokar, the Sorinam Spacecraft Mechanic; Talon Blackwing, the Dravonian Mercenary; Turok the Toyoc Spacecraft Pilot; and Lunima, the Wulf Information Broker. 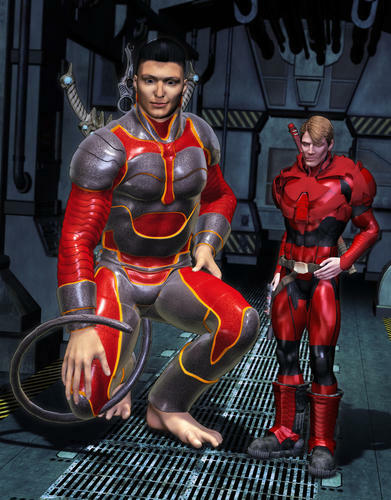 Aliens Unlimited is a supplemental setting for Palladium Books' Heroes Unlimited RPG. I've been designing the spacecraft for the group all week in what little freetime I've had, and transcribing their characters so they're legible on my fillable character sheet .pdfs. 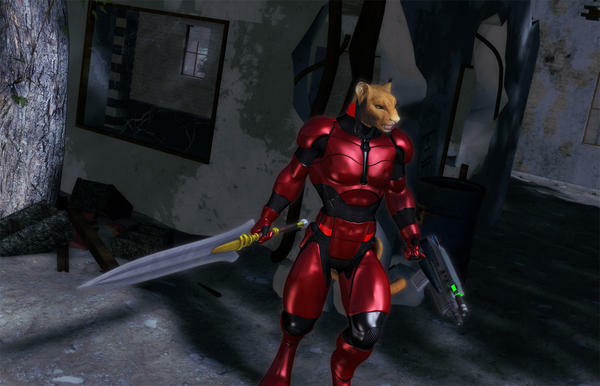 To take a break yesterday I threw this one together, an alien assassin from the Linx race, exploring a ruined city.. I mostly do renders for things that take my fancy, but here recently I've been doing illustrations for an RPG I've been working on. 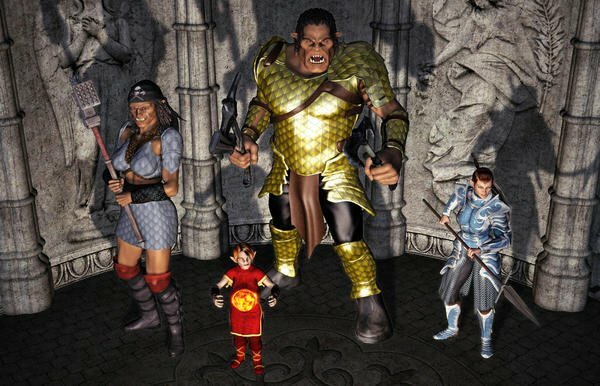 This particular image has all but one of the player character races depicted. Some are more of a stretch than others. I just can't get happy with the hobgoblin, and I can't get genesis as thin as needed for the leaflis, but it is what it is. They look good. The hobgoblin in Palladium Fantasy is just a bigger goblin. Thanks! My take on hobgoblins is a bit different than most. They get their name from "hob-nobbing", are unnoticed, and live in the attics. For whatever reason I just can't seem to tweak the dynamic hair to get the look I want. Ah well. Here's another picture I did for an advertisement for "Troll & Hero", a fictional gaming company. My paper miniature designs are going to be published by Palladium Books on their Drivethrurpg.com account and will be an official product. 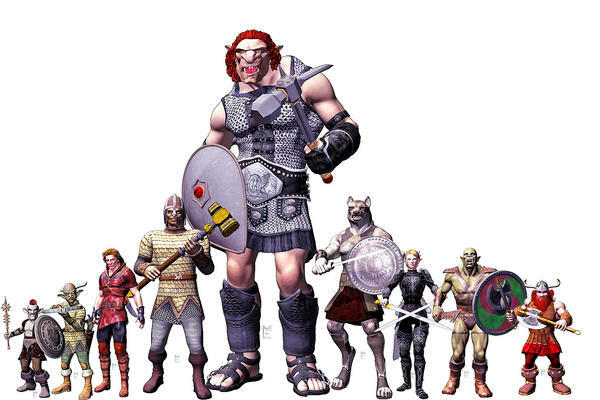 Here's an image I did as a height comparison for Palladium Fantasy races; from left to right: Goblin, Hobgoblin, Human, Ogre, Troll, Wolfen, Elf, Orc, and Dwarf. Not pictured are the troglodyte and the kobold, both of which are the size of Dwarves; PF Kobolds are just really ugly Dwarves. Very nice. Your renders have a nice, clean look to them. Well done. Thanks. I run all my renders through a post-work process in Photoshop CS5 to give them a bit of a toon quality. 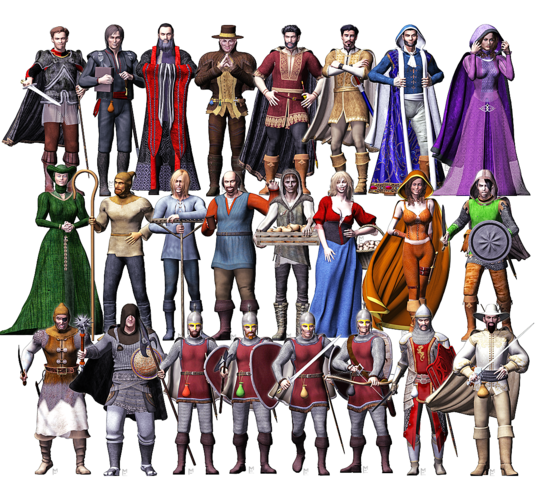 Put together six of these figures in the past 24 hours to make this image, approved by the game designer himself. 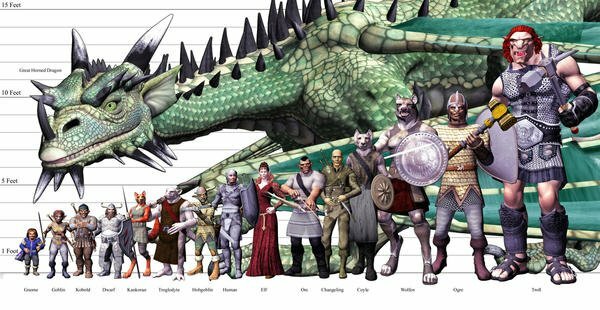 Here is my Palladium Fantasy Racial Height Chart. 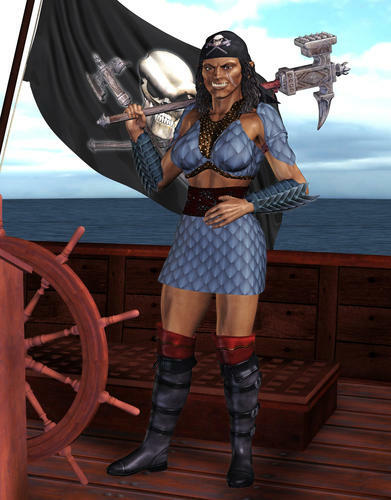 A commission I just did, Hellmillia Greyaxe, a Pirate Ogress from Palladium Fantasy RPG 2E. Second commission for the same client, his pirate and her crew. For scale, the Elf on the right is 6ft tall. Renowned throughout the Milky Way, Fealix and Jim, gladiators extraordinaire! Undefeated in the arena with 99 straight victories, Fealix amazes the fans wielding three Kisentite swords while the deadly Jim provides comic relief with his own Kisentite sword and a laser pistol. Other gladiators fear them, the fans love them, and you too can marvel at their martial prowess this weekend at the Jeven Corp. Arena on Neliv 7! *Travel Advisory* Due to ongoing battles on the continent of Goereth, all incoming space traffic must arrive through the Jeven Corp. Spacegate and follow the ordained flight plans. A character portrait for my Aliens Unlimited game; Jim was a helicopter pilot in the United States Coast Guard investigating reports of a downed aircraft in the north Pacific ocean when he disappeared. The craft turned out to be an alien ship and it's crew abducted Jim to experiment on him, with the hopes of turning humans into cheap combat drones. The experiment was deemed a failure when the chip implanted in Jim's brain not only failed to make him follow orders, but also activated a latent potential for psychic abilities. Jim quickly escaped captivity, but had no way of knowing how to get home to Earth. It wasn't long before he joined Fealix as a gladiator using the new skills provided by the implant and now he travels the galaxy on great adventures, always keeping an eye out for backwater planets that might be home..
"Tundra Rangers always get their man"
Woot! 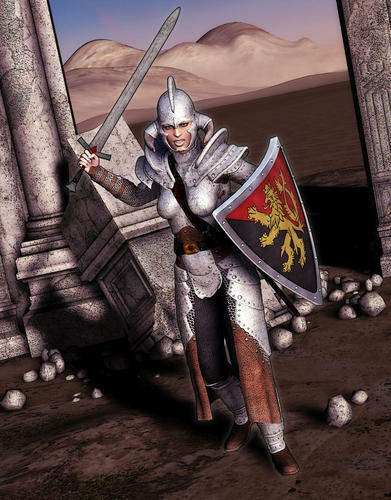 My official Palladium Fantasy RPG® 2E Paper Miniatures project is about to hit the market at DriveThruRPG.com!! 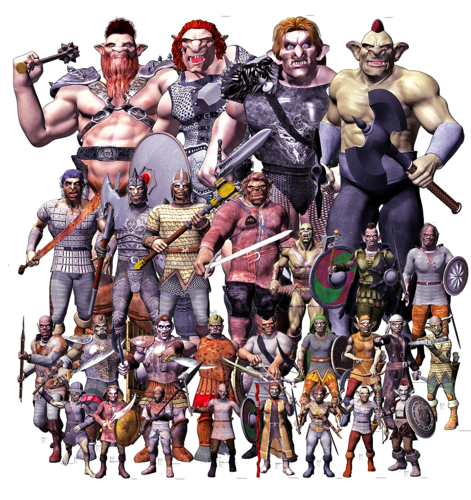 There will be a free sample set with four gladiators, and two sets initially for sale; Set one represents all of the character classes from the main book, and set two is a horde of monsters for your characters to fight. This morning I've completed the third set, Non-Player Character encounters, but it will probably be a while before it hits the store. Looks good. I'm definitely going to check it out. Thanks! I'll post more info here when they hit the store. First two sets are in the store! I'm working on a Great Horned Dragon right now that should end up being about 7 inches tall and 10 inches wide.. Hectic trip to GenCon, but I got to show off my paper minis there and took a few photos too..
And last week I even got to game for a change. 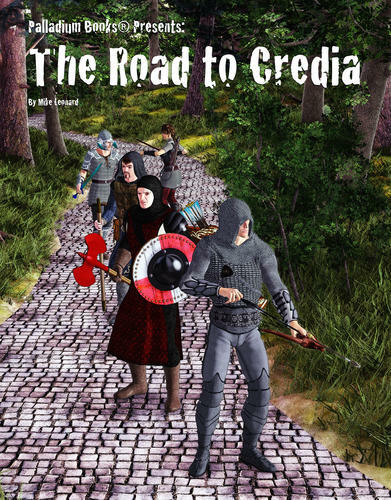 I ran Palladium Fantasy with my friends and afterwards did this image of the groups characters as though it were a book cover, The Road to Credia.